Many people will have Super Bowl viewing parties, where they eat and drink while cheering on their favorite team. 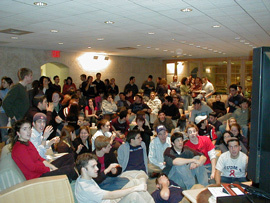 Photo from Hillel at Columbia University and Barnard College. Although it is not an official U.S. holiday, Super Bowl Sunday has become one of the biggest sporting, entertainment, and commercial spectacles in American society. The Super Bowl is the annual championship game of the National Football League (NFL), the main professional American football league in the United States. Super Bowl Sunday has grown beyond simply matching two teams playing for a championship title and trophy. Each year, the U.S. city (and stadium) that hosts the Super Bowl attracts tens of thousands of fans, the news media covering the event, and hundreds of businesses that support the game.The multi-million dollar contracts signed between the NFL and the television network broadcasting the game have transformed the game into a huge commercial event. The Super Bowl is usually one of the highest rated television programs in the United States. Since the early 1980s, companies have spent millions of dollars producing and placing commercials during the Super Bowl broadcast. In addition to avid football fans, casual fans often participate in the excitement surrounding the Super Bowl game. People celebrate the day with food, drink, and snacks. Fans often wear the uniforms of the team they are supporting.